Ten years ago, 70 million people used the Internet. Today, there are more than 1.2 billion people online, and that number is still growing. As projects like One Laptop Per Child come to fruition, we can imagine a future where it’s possible to talk to almost anyone, anywhere in the world. But what will we say to one another? 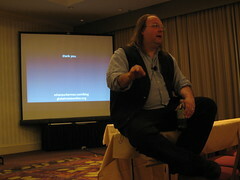 Ethan Zuckerman, cofounder of Global Voices, offers a tour of the globalized Internet, looking at ways in which users around the world are connecting – and frequently misunderstanding one another. Along the way we meet Nigerian spammers, Saudi feminists, Tunisian mapmakers and Chinese gold-farmers, as we discover the tools and guides necessary to navigate this growing new world. The program is sponsored by ITS. Geeks and librarians share a connection – we both work on creating and sharing information. One exciting type of information is the kind that cuts across borders to connect cultures and building cultural bridges. If you were a rock star in the 1980s, your life was really good 20 years ago – and now you’re hoping something will take you back to that. But if your band doesn’t have it’s lead singer anymore, what do you do? Watch videos on YouTube, looking for a really good cover band. When you find one, contact the person that posted the video and then get in touch with the singer. This happened with Journey, after a Journey song was used in the final episode of The Sopranos. The lead guitarist wanted to go back on tour, and the singer he found was in the Philippines (but try telling this story to the government officials who issue visas to come to the US – he had to actually sing to prove it was true). Journey is now out on tour with this Filipino lead singer. Our world is such that this is possible. We laugh because it is unlikely, but it is possible because we are connected like never before. It is not at all uncommon to buy bottled water from Fiji in any convenience store, or getting imported food is just about any restaurant. Competition, especially in the technology world, is often not from companies in the same town or region, but in India. It’s our infrastructure that allows this – shipping channels, undersea cables, airline routes, etc. Despite these established connections, we often do it poorly. Mike Berry, aka Shiver Metimbers, has been responding to all of the Nigerian scam emails he gets. His goal is to get them back by doing whatever he can to waste their time. He tells them he is a television producer talent scout, and tells them that he can fund them to come to the US to appear on television if they put an audition video of themselves doing Monty Python’s Dead Parrot Sketch. Or he offers a scholarship for wood carving, and makes them send him intricate wood carvings. Or he tells them he is in a church to “shivers” and to be admitted and brought to the US if they send him a photograph of themselves getting a tattoo that says “Baited by Shivers.” He justifies this because these Nigerians are taking advantage of people, but their greed is causing them to comply with him voluntarily. The problem is that this caused people to want to have nothing at all to do with Nigeria – to the point where they block their websites and domains from Nigeria IPs. Which essentially means we have started “unwiring” the world. This desire for cultural connection started with Socrates – he said he was not a citizen of Athens, but a citizen of the world. Book suggestion: Cosmopolitanism, by Kwame Anthony Appiah. He talks about bridge cultures by explaining why we’re bad at it. We’ve only been doing this for the last couple hundred years, and up until that point we really only got to know the people immediate around us. It’s only for the last few generations that we’ve had experience in getting to know people from totally different cultures. But we still view the world through filters. Nigeria has about as many people as Japan, but Americans pay much more attention to Japan – about 8 times more (as far as news stories). This produces a distorted view of the world. Alisa Miller of PRI has begun to look at how distorted our world view is based on media stories. She has started to make cartagrams, which are maps with countries sized by media coverage. Another player in this are tools like Reddit.com – it’s a social website where users rank news stories, so you can see what’s important to other people like you. This is called homophily, which is the tendency of birds of a feather to flock together. As we become more mobile and travel around the world, we find we are still gravitating towards people already like us. This causes us to become more polarized to our individual groups, because we are only listening to people with our same point of view. This is the “echo chamber” effect. This is a problem with people, but is much more a problem with nations. In print, they try to entice you to open the paper. Online, they trust you to know what you want and find it yourself. Serendipity – we are able to stumble into things or discover connections that are otherwise unavailable. This is not randomness, this is giving people opportunities. Library shelves are like this – related books are put together. How is this replicated online? Create tools that allow connections between cultures, and are not echo chambers – they bring in related information from different areas and viewpoints, to bridge these connections. These overt connections and cooperation are vital to solve problems in the modern world, because there are many subtle and complex connections that we don’t recognize. The housing crisis in the US affected Iceland, which affected mainland Europe because many of them used Icelandic banks. The first approach to a solution was for each government to work separately, but nothing got better until the governments cooperated and worked in concert to address the problem. To do this, we need to get past our filters – read newspapers and blogs from other cultures (and get someone to translate why these stories are important to the people there). Blogs and bloggers are great ways to build bridges. Bloggers are people (egomaniacs), and like to talk about and share their blogs and information with anyone who contacts them. To get better globally, we need to look for tools that help us get past this. One Laptop Per Child is one tool that lets kids in Nigeria not just connect to other cultures, but contribute to the global culture. We also need to engineer serendipity, to give people the opportunity to stumble upon the information they need that they didn’t know they need. We need to get people out of their flocks once in awhile. We need to be more xenophily. Can you tell us more about Global Voices? Check out globalvoicesonline.org – it is our aggregator for world news. Paid editors (about $800/month) recruit a team of people to cover what’s doing on in a particular country. We collect news in about 25 languages, and put out stories in about 15 languages. What does the CIA think of Global Voices? What’s the future of the media? The media is driven by following cycles and trends, and not reporting necessarily on news. However, they are responding to what the public wants, so it’s not entirely their fault. What we need to do is learn what we should be paying attention to, and then the media will respond with these important stories. We know so little to start with (outside our echo chambers) so people don’t know what to look for. Were you involved with OLPC, and how is it working? I’m friends with Nicholas Negroponti (founder, at MIT), and we argue a lot about it. He wants to change the education systems in developing nations. The problem is it was marketed as the $100 laptop, but ended up being $250. Also, educators hated it – they were distractions in the classroom, and kids liked them more than paying attention to teachers, and teachers were not trained to teach with them. This is because they were developed and launched without cultural sensitivity to how they would be used in these environments. Can you talk more about building serendipity into library websites? My “engineer serendipity” call was a cry for help. Amazon is doing this really well, with their purchase circles (what are people in my town buying – try to figure out why). It’s tricky online, because there is no rigorous definition for it. It needs to be both surprising and interesting, so needs to be related to connect in some way, but not something you already know about. 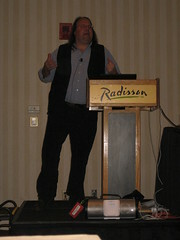 A lot of computer systems are based on ratings. LibraryThing has the unsuggester, which is a unique approach to it. Sometimes the best we can do is go for “arbitrariness within context,” and just see what happens and hope for the best. Not that I’m impressed a lot, but this is a lot more than I expected for when I stumpled upon a link on Delicious telling that the info here is awesome. Thanks.